304 & 316 Stainless Steel Cord Grips are In Stock and Ready for Your Demanding Application. Choose Remke stainless steel electrical connectors and cord grips for heavy-duty reliability in all types of harsh environments. From high-humidity to high-powered washdowns, harsh chemicals to relentless salt water, Remke stainless steel cord grips create durable electrical connections in demanding applications. With a vast number of options available for the configuration and materials for stainless steel electrical connections, get exactly what you need for any demanding environment with Remke! Our IP and NEMA rated stainless steel cable connectors and cord grips are in-stock in more sizes and options. Stainless steel resists corrosion in tough elements such as chemicals, liquids and abrasives to deliver secure electrical connections in the most demanding applications. Type 304 Stainless Steel Cable Connectors have excellent corrosion resistance as well as oxidation resistance. Stainless Steel connectors are in-stock for conduit sizes ¼” to 3” – the most sizes of any manufacturer! All connectors are UL Listed in 3/8” to 1-1/2” sizes. Standard Stainless Steel Cord Grips NEMA 4, 4X & 12 with Type 304 standard, Type 316 available, 9 conduit sizes in-stock, 61 in-stock part numbers and 55 part numbers in-stock with wire mesh. Stainless Steel Watertight Conduit Hubs NEMA 4, 4X & 12 with Type 316 standard and 10 conduit sizes in-stock including grounded styles. Stainless Steel Liquidtight Conduit Fittings IP 68 & NEMA 4X with Type 304 standard, 7 conduit sizes in-stock, 7 straight and 7 ninety-degree part numbers in-stock. 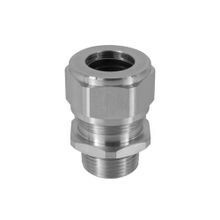 Stainless Steel Ventilation Plugs IP 69K with 3 thread sizes in stock, additional thread sizes & permeability levels available, designed to reduce the adverse effects of humidity in the environment by preventing pressure increase inside the enclosure and limiting temperature increase through air circulation. 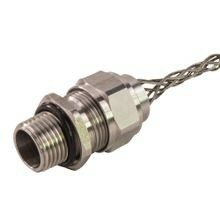 Custom Stainless Steel Connectors including variations, adaptations, specials and full-scale custom products for small or large quantities, with Pg or Metric Threads. Other manufacturers do not offer this service for their stainless steel connectors. Remke Engineered Solutions is entirely focused on meeting the needs of a single customer. Our Job #1 is to develop application-specific, custom stainless steel cable connectors that meet precise specifications.